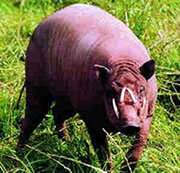 The Babirusa is found in Sulawesi and surrounding islands of Indonesia. It closely resembles a pig, but scientists believe it may actually be related to the hippopotamus. It is also called the pig-deer because of its hooked upper and lower tusks, which are actually overgrown canine teeth. The upper tusks of males erupt through the top of the snout and curve back toward the eyes, giving them a very odd and threatening appearance. The tusks of females are shorter and hardly visible. It is believed that the tusks are used the same way antlers are used by deer, but the tusks of the babirusa are more sensitive and can break off easily. Babirusas are brown to gray in color and their skin is hairless. Their legs are long and thin. Adults reach about 3.6 feet in length and weigh up to 220 lb, and males are larger than females. Babirusas can be found in the underbrush of tropical forests and canebrakes and prefer to be near the shores of rivers and lakes. They are omnivores, feeding mostly on fruit, leaves, or grasses. They will also eat fungi, nuts, insect larvae, small rodents and birds, and carrion. Little is known about their behavior since they are secretive and shy. During the day, they may wallow in mud, which helps rid them of insects and parasites. They prefer to feed and graze on grass at night and in small groups consisting of several females and their young. Males prefer to live on their own after they are mature enough to leave the group, and when ready to mate, they fight with other males so that they can mate with several females. Females give birth to one to two young after a gestation period of 150 to 157 days. Babirusas are endangered due to excessive hunting for their meat and habitat loss due to agricultural development. This species has always been rare, and although it is legally protected, some hunting still occurs. Also, they are persecuted by farmers who consider them a nuisance to their farmlands. 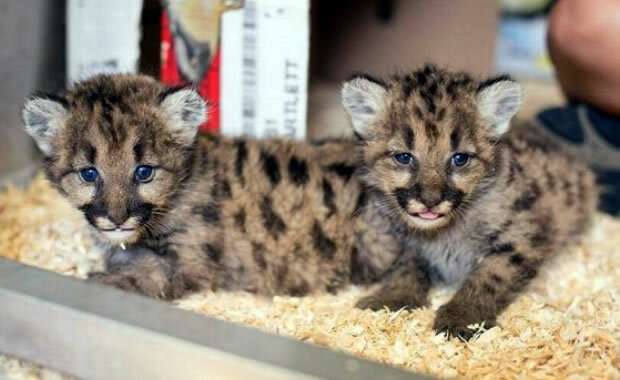 The latest population estimate is about 4000 individuals, but some can be found in zoos, and the Stuttgart Zoo of Germany has established a captive breeding program. Copyright Notice: This article is licensed under the GNU Free Documentation License. It uses material from the Wikipedia article "Babirusa". Glenn, C. R. 2006. "Earth's Endangered Creatures - Babirusa Facts" (Online). Accessed 4/20/2019 at http://earthsendangered.com/profile.asp?sp=18&ID=3.